Silver and white color combination look surreal. It is reminiscent of the icy winter days. So this Christmas, forget the traditional green and red and opt for silver and white theme instead. It is neutral and can be used all winter long. Here are 40 brilliant ideas to help you transform your house into a home straight from the fairytale. Wrap the wire topiary trees with sparkling garland and add glass bits or rocks as a substitute for soil. This idea will turn even the warmest of the house into a winter wonderland. White and silver ornaments look elegant and exquisite, especially against fresh boughs. You can even add a few glittered snowflakes to add loads of shine to the décor. Suspend white and silver snowflakes from the chandelier for a quick decoration. You can hang the snowflakes at varying heights for more interest. It is a shame to the family heirlooms to leave the silver dinnerware unused. You must take them out at least, for the holidays. Top a silver tray with a white dinner plate. Next, roll a white linen napkin in a silver ring and place on the plate. Easy, isn’t it? If you still want a brighter tree, take a white and silver and decorate it with colorful ornaments. Even black decorations on white trees look dramatic. Give a contemporary look to your house with this decoration idea. We love the silver votives and twigs used in place of flowers. Create a star studding table setting with this lovely idea. Roll the white napkins and slip them though silver or rhinestone bracelets. You can even consider making your own napkin rings using rhinestones. Make your candleholders reflect your vivacious personality with this lovely idea. Coat the glass with glue and roll in clear glitter. Attach a white or silver trim and you are done. This idea is downright adorable. We loved the addition of little wooden angels, silver glasses as candle votives and shimmering snowflakes. This silver tree looks incredibly gorgeous. It will make a perfect addition to your modern décor. You do not always have to go over the top to give a Christmassy look to your living room. In this idea, the focus is one the mantelpiece. Here’s a fancy way to add fluff and fancy to your Christmas décor. Click the link for full instructions. Here’s another lovely way to deck your Christmas tree as per your theme. Make the Christmas tree the focal point of your dining room this Christmas. Add a few white and silver ornaments here and there and you are done. Here’s a lovely way to deck your yard. It has a perfect amalgamation of green, white and silver. A branch tree decorated with silver ornaments would look beautiful on your side table. The decoration idea seems like has been taken straight from a fairytale film. It’s ethereally beautiful. Do you have some extra ornaments lying in our house? Then put them to use by displaying them in cloches or clear glass vases. This idea is utterly cute, especially the bearded Tomte. If silver and white combination is getting too much for you, add a pop of color by placing red vases near the silver tree. We loved the silver ornaments, white candles, and pinecones used in the decoration. You can leave it all winter long, even for the New Years. Bring an earthy touch to your décor by placing these cute little ornaments on the center table. Purchase silver berries or jingle bells from the hardware store and place in a white pitcher along with a JOY ornament. Deck the wall shelf with silver baubles hung from white ribbons, white tissue flowers, a white plate and a reindeer statue. Fill a large ironstone tureen with steaming soup and place on the dinner table for a lovely arrangement. You can even scatter silver ornaments, glass trees and votives for an added effect. Glitz up the plain tableware by adding some silver baubles and metal cake plates. Here’s another simple, yet effective white and silver decorating idea. The mantel of this house is dressed with a large mercury Christmas tree and silver ex-voto. The addition of bottlebrush trees, greens, and giving a lovely touch to the house. This led glitter branch will add sparkle and a romantic glow throughout the celebration. 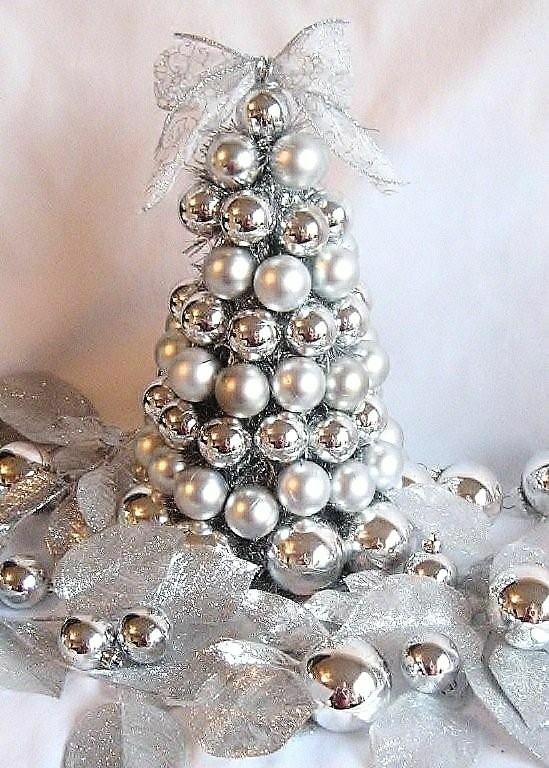 We love this unusual white and silver Christmas tree. Very different from what we had seen before. This table setting idea is perfect for a winter dinner party. You can also go for blue or teal colored table runner. Here’s a lovely centerpiece idea for you. The silver candles are coated with glitter and placed on mercury candleholders. If you want, you can skip the blue and add white ornaments. This is such a fresh white and silver modern decoration. Gather a few silver candle holders and place white pillar candles on it. Place a silver reindeer and silver and white ornaments in front of a mirror to showcase the beauty of the holidays. So you want a silver and white décor, but cannot part with your favorite color blue? No worries, add a blue touch to your silver and white décor by placing blue ornaments. Create a simple, yet stunning tablescape with mercury glass candle holders and silver jingle bells. It will emit a twinkling glow that will bring holiday spirit to the house. We love this white and silver holiday themed bookshelf. The addition of Brown is enhancing its beauty. Make use of your old baubles by making this lovely garland for your kitchen. It’s standing out against the white backdrop. Do you have your child’s dollhouse or castle lying in your storeroom? Then bring it to use by making a beautiful snow castle. Stack some well-wrapped boxes near your white Christmas tree and see the difference that it creates. Do not forget to decorate the tree with ornaments.